Last night I attended the Chesapeake Bowl in Towson, Maryland (just outside Baltimore). The Chesapeake Bowl is a post-season all-star game between players from Pennsylvania, Delaware, and New Jersey (the North) and players from Virginia, West Virginia, the District of Columbia, and Maryland (the South). Not only was it a game studded with high school stars being recruited by Michigan and other Big Ten teams, but one of my high school program's players was involved, too. North Team players of interest were Damiere Byrd, Kyshoen Jarrett, Dondi Kirby, Sheldon Royster, Desimon Green, Bill Belton, Armstead Williams, Ben Kline, Deion Barnes, Paul Gaughan, and Jack Tabb. South Team players of interest were Vincent Croce, Darius Jennings, Malcolm Crockett, Kevin McReynolds, and Darian Cooper. I went to Towson on my way home after travelling to Michigan for a holiday visit, so I was slightly unprepared for watching the game. I would have jotted down some notes, but I didn't have a note pad or a pen . . . and frankly, the cold and my lack of gloves would have prevented me from using a pen effectively, anyway. So I'm operating purely on mental notes. The North team seemed like the more impressive roster, and they showed it by jumping out to a 14-0 lead in the first quarter. The South offense moved backward consistently in the first quarter until backup QB Perces Goings came in and gave the offense a little spark. He was replaced after a series or two, but the offense had found a rhythm by then. The South cut the lead to 14-7 only to watch the North go back up by a score of 21-7. After that, though, it was pretty much all the South. They scored 23 unanswered points to take a 30-21 lead. The North made one last push with a touchdown pass in the corner, which was caught by Michigan target Jack Tabb. But the onside kick went out of bounds with 1:43 remaining in the game, and the South ran out the clock. Deion Barnes, DE (North): He was on the roster, but I didn't notice him on the field. Bill Belton, WR (North): Did not play due to injury. It looked like he had a cast on his right hand. Damiere Byrd, WR (North): He was on the roster, but I never saw him. Committed to South Carolina. Darian Cooper, DT (South): Cooper started alongside Kevin McReynolds at defensive tackle, which makes a very imposing interior defensive line for a high school game. Cooper really didn't seem that impressive, but it's hard to take much from these all-star games, where teams only have a few practices to prepare and most of these kids haven't played football since mid- to late November. I sat next to Cooper's family, but I didn't want to be a tool and start talking up Michigan or anything. From sitting next to his family, though, they seemed to be very congenial, friendly, intelligent people. They cheered enthusiastically throughout the game, but they weren't obnoxious like a certain recruit's family that sat behind me. If Cooper follows in his family's footsteps, then I can only assume that he would be a high quality kid to add to the Wolverine program. Vincent Croce, LB/DE (South): He started the game at middle linebacker and played some defensive end in passing situations. I'm sure Croce will end up on the defensive line in college, but he did a decent job as a linebacker. He has a bit of a strange body. His legs are kind of short and then he has a thick upper body. He also seemed to be very involved with his teammates and a bit of an emotional leader. Committed to Virginia. Malcolm Crockett, RB (South): I was excited about seeing Crockett play, but he really didn't do much at all. He started at running back for the South and played most of the game, but neither team really ran the ball very well. Both teams seemed committed to the pass, even though it was freezing and the receivers dropped a number of passes. However, one thing I noticed was that Crockett was constantly running on the sideline, pantomiming taking handoffs, doing footwork drills, etc. whenever the defense was on the field. He really seemed like he was involved in the game and trying to stay ready, which I think shows good character. Committed to Cincinnati. Paul Gaughan, OT (North): I didn't watch the line as much as I would have liked, but I believe he started and played most of the game. Committed to Boston College. Desimon Green, WR/DE (North): Michigan recruited Green to play DE, but Green played nearly the entire game at WR for the North - and he played it well. At 6'5" and 225 lbs., he caught several leaping passes, including a touchdown reception in the corner of the endzone, and ran fairly well after the catch. There was also a very interesting play where a pass over the middle bounced off Green's hands, got intercepted by the trailing defensive back, got fumbled by the DB before he hit the ground, was picked up by Green, and was run for another 30 yards or so before Green got tackled inside the 10-yard line. Green was perhaps the most impressive player on the field. He played well at WR and got a couple snaps at DE. Kyshoen Jarrett, CB (North): Let me put it this way - Jarrett reminded me a lot of Boubacar Cissoko a couple years ago, when Cissoko would wave his hands demonstrably after every play, even mediocre ones. An early 15-yard penalty for taunting curbed his enthusiasm a bit, but the refs probably missed at least one more 15-yard-worthy action of Jarrett. Jarrett did have the talent to back it up (2 interceptions and at least 1 pass breakup), but I'd like to see him talk a little less. Committed to Virginia Tech. 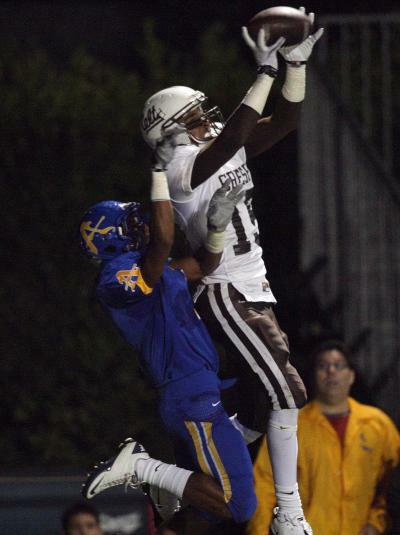 Darius Jennings, WR (South): Jennings was probably the best all-around player on the field. He ran the ball, caught the ball, and completed both passes he attempted, each of which came on end around plays; he would take the handoff from the quarterback and then drop back. Jennings hit the QB on one pass for a good gain and then threw a TD pass to a WR. He also scored on an end around early in the game, which set up those trick plays. Dondi Kirby, S (North): He tore his ACL prior to his senior season and did not play, but seemed to be emotionally involved with his teammates and was a cheerleader on the sidelines. Committed to Illinois. Ben Kline, LB (North): Had some big hits (and got blasted once) from his linebacker position. He was heavily involved in the defense and looked physically ready to contribute at the college level. Committed to Penn State. Kevin McReynolds, DT (South): McReynolds is huge. He's listed at 6'3.5" and 300 lbs., but he was a very solid 300 pounds, unlike a lot of high schoolers you see. Not only big, he looked extremely powerful. And he played like it, too. He's one of the reasons that the North couldn't run the ball consistently, and he got a good push up the middle of the pocket, too. Sheldon Royster, S (North): Royster started the game at safety and showed some good makeup speed in the passing game and on special teams. I've held out on judging Royster because I've seen very little film on him, but after seeing him in person, he's definitely someone I'd like to see wearing the Maize and Blue. On a slightly funny play, Royster walked up to the line of scrimmage, seemingly to cover a slot receiver; then he blitzed off the edge and absolutely crushed the quarterback. Unfortunately, the rule for the Chesapeake Bowl (much like most all-star games) is that defenses may not blitz. But instead of handing out a 15-yard penalty for the first offense, the North team was given a warning. Jack Tabb, TE (North): Tabb didn't really stand out one way or the other. He was in on virtually every offensive snap, either at TE or lined up as a slot receiver. But even on pass plays, he was used mostly as a blocker. He did catch two passes; one was an emergency dump-off that he bobbled a bit before getting tackle for about a 1-yard loss; the other was a very nice leaping catch over a defensive back in the corner of the endzone that put the score at 27-30 with less than two minutes left. Tabb was an adequate blocker, but for whatever reason, he didn't seem to be moving at 100% speed. I don't know if he was affected by the cold or what, but he just seemed to be going 90% for much of the game. It's not that he was being lazy - it just looked like he was stiff from the cold or something. He also dropped a pass. Armstead Williams, LB (North): He was on the roster, but I didn't notice him on the field. Daquan Cooper, WR (North): Cooper returned kicks, got the ball on end arounds, etc. 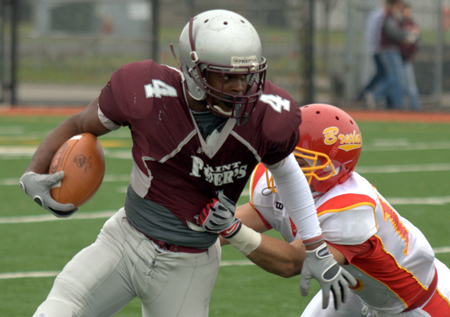 He was a slightly less effective version of the South's Darius Jennings, but he was a very impressive athlete. You got the impression that he might turn any play into a big play. No relation to Darian, as far as I know (they play at different high schools in different states). Committed to Temple. Patrick Skov, LB (North): Skov sliced through the offensive line for several tackles on the day. I heard his name repeatedly, and he was a very solid hitter. Committed to Stanford. Matt Zanellato, WR (South): He's a tall, skinny kid committed to Penn State. He's very good at going up and getting the ball at its highest point, as evidenced by his one touchdown catch. He also has a little bit of speed to him, getting behind the defense on a deep pass (and a perfectly thrown ball) by quarterback Kevin Hogan. 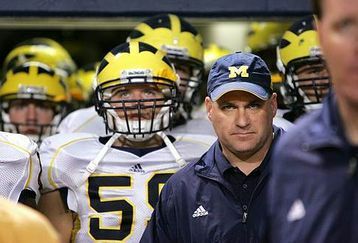 Poll Results: Who will be Michigan's coach in 2011? 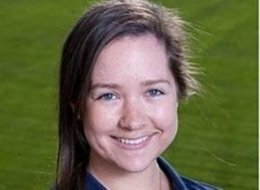 I said a few weeks ago that I think Rodriguez will be fired. I'm not totally convinced that firing Rodriguez would be a good idea, but I'm sticking with that prediction. We'll find out for sure in a week or two. Added Matt Goudis (K), who changed his commitment from Boise State to Michigan. Drew Owens (TE) committed to South Carolina. 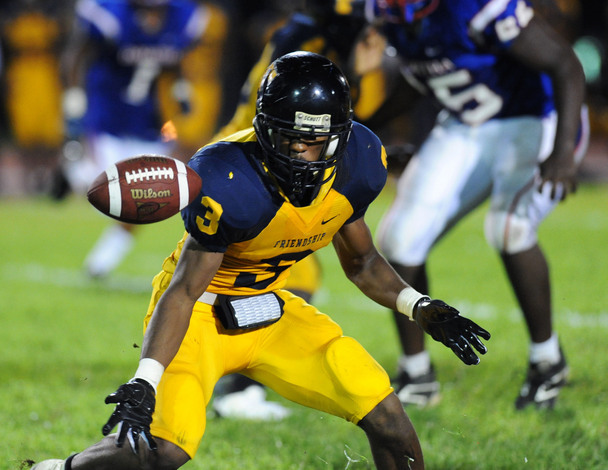 Demetrious Nicholson (CB) committed to Virginia. Kyshoen Jarrett (CB) changed his commitment from Pitt to Virginia Tech. Jonah Austin (OT) changed his commitment from Houston to LSU. Dondi Kirby (CB) committed to Illinois. Travis Hughes (ILB) committed to North Carolina. 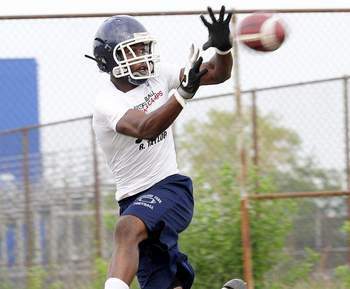 Miles Shuler (WR) committed to Rutgers. Nick Waisome (CB) changed his commitment from Florida to Florida State. Added Raymon Taylor (CB), who is an Indiana commit. Ryan Shazier (OLB) changed his commitment from Florida to Ohio State. Posting will be fairly light around the holidays. Like many others, I'll be busy and/or travelling for much of the next week or so. Here's hoping that you and your families have a happy and safe holiday season! 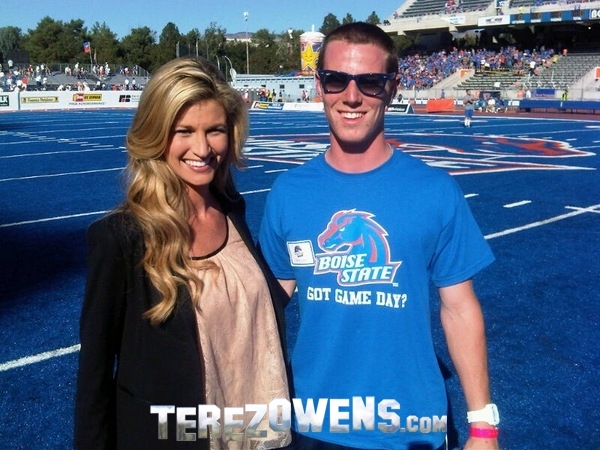 Kicker Matt Goudis with ESPN sideline reporter Erin Andrews. If you were wondering, Goudis is on the right. Kicker Matt Goudis flipped his commitment from Boise State to Michigan yesterday. Goudis is 6'0" and 165 lbs., and he hails from Chaminade High School in West Hills, CA. He is the #5 kicker in the country according to Scout, #12 to Rivals, and #16 to ESPN. I’ve also ran three fake punts this year, which is a good reason why Boise State likes me – my athletic ability. I had some trouble with my field goals this year because I’ve been coping with a new snapper and holder, but that just happens sometimes. Goudis, who at one point this season was 6/10 on field goal attempts, should probably avoid trying to pass the buck like that. If I were his coach or his teammate, I would be perturbed by that statement. I've had experiences during my coaching career where the placekicker asked us to find a different holder because, in his mind, the holder was the reason he was shanking chip-shot field goals. Never mind the fact that the holder didn't botch a single snap all year, had to dig a few snaps out of the grass, and made a spectacular play to grab one that was way over his head and still get it down on the tee. We didn't replace the holder. But we did replace the kicker by season's end. Goudis ought to take responsibility for those misses, whether they're legitimately his fault or not. Matt is an oustanding kicker. He has a good leg and makes kicks consistently with great height. He is the top field goal kicker in the nation in the Class of 2011. Hard working young man with a great attitude. Big time D1 scholarship prospect. The addition of Goudis would give Michigan three scholarship specialists on the roster (kicker Brendan Gibbons, punter Will Hagerup, and Goudis) - four if you include Drew Dileo, who seems like a return specialist. But if that's what it takes to get the special teams going, then that's what it takes. I have no problem with Michigan adding a second scholarship placekicker to the roster. Mailbag: Has anyone else deserved the #1 jersey? 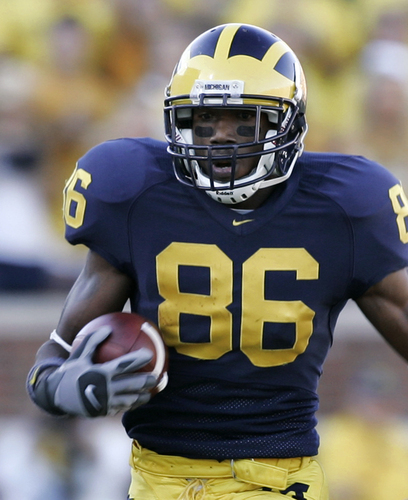 As you know you put Mario Manningham as your Former Michigan Athlete of the week, and it reminded me of a question I've always wanted to ask a fellow Michigan fan. Since the time of Braylon Edwards we haven't had a WR wear the #1 Jersey. If you had to look back on the receivers we've had, which one would you think would be the most deserving of the #1 jersey? But it was Edwards who turned the #1 into what it is today. After requesting that number before his junior season, head coach Lloyd Carr told him that he would have to earn it, so as not to disrespect his childhood hero; Edwards was going to have to work hard on the field and become a leader in order to exchange his #80 for #1. Edwards, who had suffered from inconsistency and suspect hands up to that point, stepped up his game and his leadership, and with a good deal of hype, was awarded the #1 jersey prior to his junior season in 2003. 1. 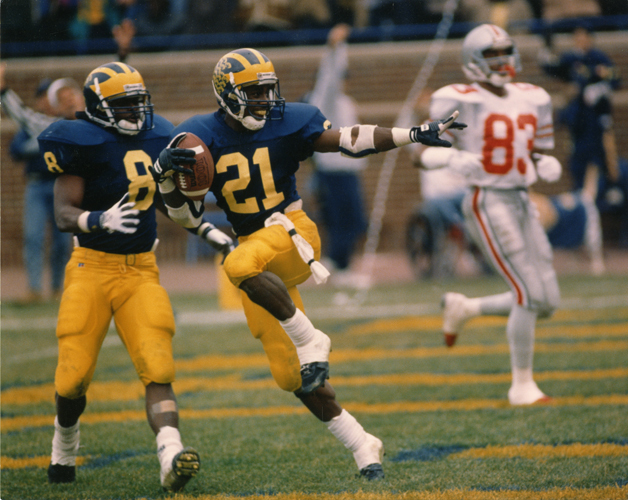 Desmond Howard (1989-91), #21. Howard was the country's most electrifying player in 1991, scoring 19 receiving touchdowns, 1 punt return touchdown, and 1 kickoff return touchdown. He also caught 62 passes for 985 yards for an average of 15.9 yards a catch that season. And all of those accomplishments came on the heels of a 1,000-yard season in 1990. In addition to his receiving skills, he averaged 13.8 yards a carry on 23 attempts in his three seasons, scoring 2 touchdowns. He also averaged 26.9 yards a kickoff return and 13.0 yards per punt return. Oh yeah, and he won some kind of trophy or something. 2. Amani Toomer (1992-1995), #18. Toomer is a tough one. Michigan's offense evolved throughout the 1990s into the mid-2000s, from a 3-yards-and-a-cloud-of-dust mentality to a we'll-chuck-the-ball-whenever-we-feel-like-it mentality. Toomer was still in that early phase and played with the likes of Tyrone Wheatley and Tshimanga Biakabutuka, two stellar running backs. Toomer wasn't particularly big or fast, but Michigan's powerful running game opened up plenty of space downfield for the quarterbacks to throw. As a junior, he gained 1,096 yards despite only catching 54 passes. He then capped his career with 44 catches, 758 yards, and a career-best 7 touchdowns in 1995. 3. Marquise Walker (1998-2001), #4. As a junior, Walker was the second receiver behind David Terrell and still managed to grab 49 passes for 699 yards and 4 touchdowns. Walker stepped it up another notch as a senior, totaling 86 catches for 1,143 yards and 11 touchdowns once Terrell had moved on to the NFL. He had six 100-yard games despite being the only significant receiving threat, including 15 catches, 160 yards, and 2 touchdowns against Ohio State that year. 4. Tai Streets (1995-1998), #86. Streets had a solid sophomore season during which he caught 44 passes for 730 yards and 2 touchdowns. He suffered from an injury late in his junior season, which helped limit him to 28 catches for 476 yards and 6 touchdowns; however, he had 4 receptions for 127 yards and 2 touchdowns (including a 58-yarder) in the Rose Bowl game against Washington State that propelled Michigan to a national title. 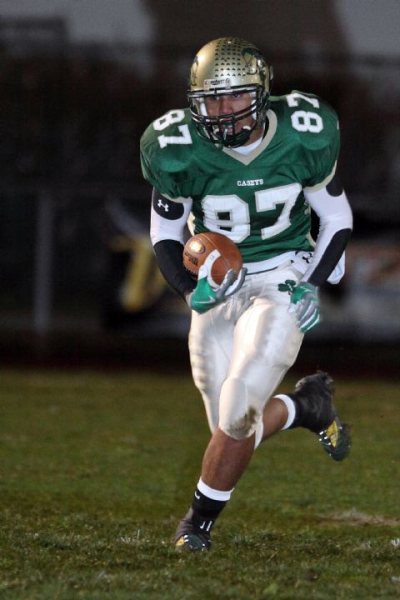 As a senior, Streets had 67 catches for 1,035 yards and 11 touchdowns. 5. Jason Avant (2002-2005), #8. For his first three seasons, Avant played second fiddle to Braylon Edwards. He notched only two receptions in 2002 (hello, burned redshirt) and then had 85 catches spread over his sophomore and junior seasons. Once Edwards went off to the NFL, Avant caught 82 balls for 1,007 yards and 8 touchdowns. He was very reliable; I only remember him dropping one pass in a Michigan uniform, and I was astounded. But he only averaged 12.3 yards a catch as a senior. Reliable, but not a gamebreaker. 6. Mario Manningham (2005-2007), #86. Manningham burst onto the scene as a freshman in 2005, when he caught the game-winning score from Chad Henne against Penn State. He averaged 18.5 yards a catch and scored 9 touchdowns as a sophomore, then followed that up with a 72-catch, 1,137-yard, 12-touchdown effort in 2007. He had a couple stellar games against Notre Dame in his career and caught a 97-yard touchdown pass from Ryan Mallett toward the end of 2007. Those are great numbers. Except Manningham struggled with off-the-field issues while at Michigan, which got him suspended for one game in 2007 and ultimately caused him to drop in the 2008 NFL draft. If Edwards had to work harder and become a leader, Manningham certainly wasn't deserving of the honor. 7. Steve Breaston (2003-2006), #15. Breaston is one of those players about whom you think, "I bet he was a stud in college now that he's having 1,000-yard seasons in the NFL." He's having a solid NFL career with the Arizona Cardinals, but his numbers as a receiver were far from spectacular in college. Granted, his career overlapped those of Edwards, Avant, and Mario Manningham, so opportunities were scarce. Still, Breaston averaged just 39 receptions, 424 yards, and 2.5 touchdowns a season in a career where he saw significant playing time every single year. His biggest asset was his return ability, which saw him average 24.6 yards on kick returns and 12.6 on punt returns, with 5 total touchdowns. Any team would love to have him as a second or third wideout, but his limited production and iffy hands prevent him from being a #1 guy. 8. Mercury Hayes (1992-1995), #8. Hayes was a solid but unspectacular receiver who played alongside Toomer for all four years at Michigan. He had an outstanding senior season in 1995, with 48 catches for 923 yards (19.2 yards per catch) and 4 touchdowns. But the preceding years were just mediocre, and he didn't offer much in the way of versatility (running, returning punts and kicks) to give him the nod. Statistics obviously don't tell the whole story. If you go by touchdowns only, the trio of Edwards, Carter, and Howard are the only receivers with 30+ career touchdowns. If you go by yardage, well, there are a fair number of 1,000 yard receivers, too (Streets, Walker, Avant, Manningham). A big part of the #1 jersey seems to be "feel." How dominant was the player? Was he a one-man wrecking crew? Was he a leader? Was he the quarterback's go-to guy? It's also difficult to judge who's worthy of the #1 jersey because, frankly, Derrick Alexander (who had mediocre statistics) and Tyrone Butterfield (who barely played, period) skew the statistics significantly. If those two players arrived on campus in the post-Braylon years, neither one would get the #1. I gave the nod to Desmond Howard because he was clearly a dominant player, won the Heisman trophy, and set Michigan's record for receiving touchdowns in a season. I also gave the nod to Amani Toomer, which was tough to decide; while he didn't have an overwhelming senior season, he did have 1,000 yards as a junior and averaged over 20 yards a pop. He could easily have been awarded the #1 jersey for his senior season like Braylon, but then would have put forth an underwhelming senior year. The senior versions of Tai Streets and Marquise Walker were both worthy of the #1 jersey by post-Braylon standards. But their mediocre seasons as underclassmen meant that they didn't reach that status until their senior years were completed. Oddly enough, Mario Manningham was perhaps the second-most talented player on this list, despite coming in at #6. From a purely athletic standpoint, I would rank Manningham just behind Desmond Howard on this list, and ahead of #1 jersey wearers like Alexander, Butterfield, McMurtry, and even Terrell. Unfortunately, he falls down the list because of his off-the-field issues. If Braylon Edwards couldn't get the jersey until he proved himself as a worker and leader, then Manningham clearly never reached that point. It's difficult to compare across generations. Michigan's offense, the rules of college football, and the overall philosophies of football have changed immensely in the last 20+ years. But using hindsight to look back across the past two decades, I only see two additional players who were deserving of the #1. New York Giants wide receiver Mario Manningham had 8 catches for 113 yards and 2 touchdowns. Unfortunately for him, the Giants lost to the Eagles on a last-second punt return by Desean Jackson. Final score: 38-31. Honorable mention: Arizona Cardinals defensive tackle Alan Branch had 6 tackles, 1 tackle for loss, and 1 forced fumble, but the Cardinals lost to the Seattle Seahawks by a score of 19-12. Jordan Barnes, who committed to play linebacker at Michigan in the 2009 class, has resurfaced on the college football radar. Barnes planned to be a Wolverine, but Michigan's coaches "lost his phone number" (in other words, they stopped communications and strongly hinted that Barnes should go elsewhere). Barnes got the hint and committed to Oklahoma State instead. But after redshirting in 2009, Barnes left the team and enrolled at Western Oklahoma State College, which doesn't have a football program. Standing 6'1" and 240 lbs., Barnes has signed a junior college Letter of Intent to play football for the Toledo Rockets in 2011. For more recaps of former Michigan commits or players who left Michigan early, check out the Ex-Wolverine Encyclopedia tab at the top of the page. I have been asked to contribute to Maize 'n' Brew, a blog about all Michigan sports. I will continue to post frequently here at Touch the Banner, but I'll be adding some recruiting information and doing some X's-and-O's breakdowns for the guys over there, too. The cold, wet weather in Maryland had one advantage for Michigan and its fans. Cornerback Blake Countess, from Our Lady of Good Counsel in Olney, Tweeted on Friday morning that he would be playing college ball at Michigan. Countess is a 5'10", 174 lb. cornerback and a 4-star recruit to all three major recruiting services; he's also ranked anywhere between #13 and #18 in the country at the cornerback position. Countess is a very solid corner. I can't honestly say that he's "great" at any one thing. 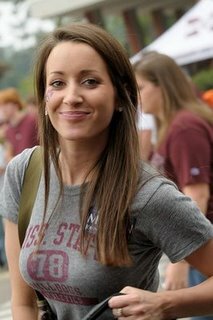 But unlike several other cornerback recruits over the past few years (Justin Turner was too big, Demar Dorsey was too thuggish, Boubacar Cissoko was short and harbored too much ill will toward delivery boys), Countess doesn't have any glaring deficiencies. He has decent size, runs well, has good hips, is a solid tackler, and tracks the ball well in the air. He ended his senior season with 47.5 tackles, 15 pass breakups, and 2 return touchdowns, in addition to 21 receptions for 302 yards and 2 touchdowns on offense. The way he moves reminds me a bit of former Michigan cornerback Ty Law, although Law filled out to be a thick, physical corner at Michigan and later in the NFL. He also seems to be an intelligent kid with good character. According to his senior highlights (below), he has a 3.1 GPA and a 22 on the ACT. He's well spoken in interviews and attends a respected private school. 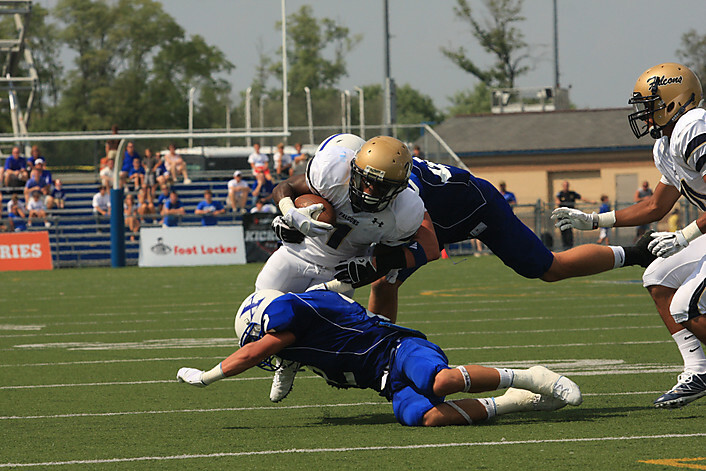 Our Lady of Good Counsel consistently puts out a couple FBS prospects, including Jelani Jenkins (Florida) from the Class of 2009 and Vincent Croce (Virginia) from the Class of 2011, both of whom were offered by Michigan. As for the pedigree of OLGC's football team, it went 10-2 and beat renowned DeMatha in the WCAC championship game this season by a score of 42-3. For some perspective, Michigan offered five DeMatha seniors in the Class of 2010, and no less than ten DeMatha kids have offers to play FBS football in the Class of 2011. On a team that obliterated a squad like DeMatha, Countess was a captain. That bodes well for his future. This gives Michigan four cornerbacks in the Class of 2011 - Countess, Dallas Crawford, Delonte Hollowell, and Greg Brown. I do not expect Michigan to continue recruiting cornerbacks for this class, at least not to commit immediately. The coaches will likely stay in contact with kids like Daren Kitchen, Valdez Showers, Raymon Taylor, and James Richardson, but only to keep lines of communication open in case one of the aforementioned players decommits. It's possible, even likely, that one of these four will move to free safety early in his career. 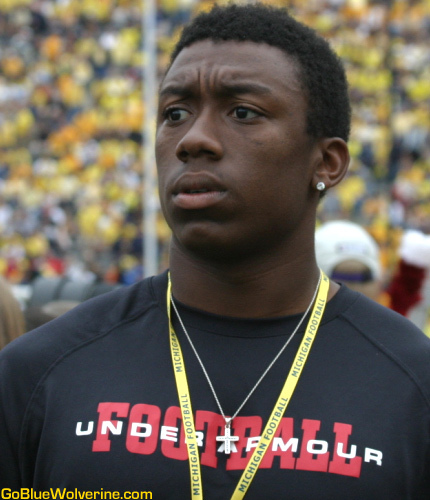 I also expect that Michigan will continue to recruit strong safeties like Wayne Lyons. Overall, this is a solid development in Michigan's recruiting, especially during a time when Rich Rodriguez's future as coach is somewhat murky. If Rodriguez can keep his job and hire a competent defensive coordinator, someone ought to be able to create a solid defense from the pieces being thrown together. Gregory Robinson (OT) committed to Auburn. Avery Walls (FS) committed to Cal. Desmond Morgan (ILB) committed to Michigan. George Farmer (WR) committed to USC. Gionni Paul (OLB) committed to Arizona State. Ben Kline (LB) changed his commitment from Pitt to Penn State. Curt Evans (WR) committed to Wake Forest. Kevin Sousa (QB) changed his commitment from Michigan to Wake Forest. Everett Golson (QB) changed his commitment from North Carolina to Notre Dame. 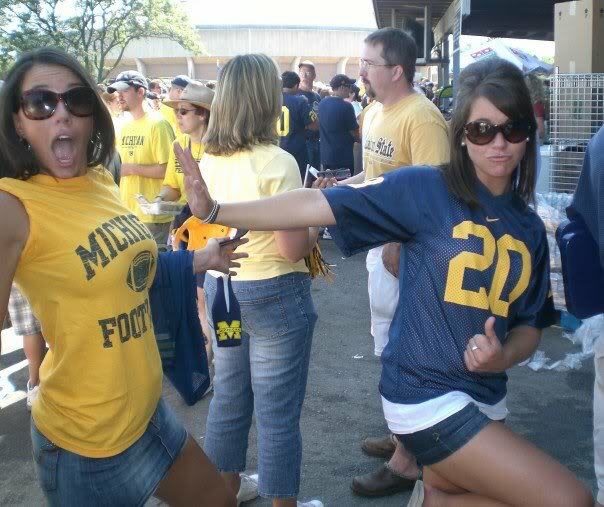 If you have other pictures of girls wearing Michigan gear, feel free to e-mail them to me at touchthebanner@gmail.com. Projection: Lyons is a very smart kid who seems to understand how the offense is trying to attack the defense. He's also a very good athlete whose hips and coordination outstrip his pure, straight-line speed. Lyons could play free safety in a pinch, but his speed wouldn't be ideal at that position; adding 15 to 20 lbs. would make him a prototypical strong safety to help in the run game. He could be a 3-year starter in a BCS-level program. Linebacker Desmond Morgan, from West Ottawa High School in Holland, MI, committed to the Wolverines on Monday after visiting for the "Big Chill" outdoor hockey game at Michigan Stadium. Morgan is a 6'1", 225 lb. 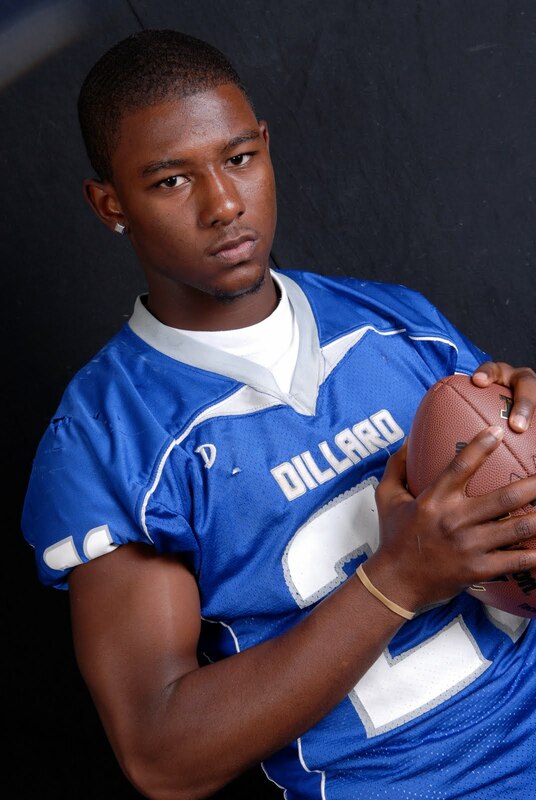 linebacker and ranked as a 3-star recruit to Rivals, Scout, and ESPN. He chose Michigan over offers from Akron, Bowling Green, Buffalo, and Northwestern. As a high schooler, Morgan played inside linebacker on defense and . . . quarterback on offense. That's not a typical combination, but he pulled it off. As I said in some previous comments about Morgan, I have some added respect for recruits who played quarterback in high school. They typically tend to understand better how the entire team works together within a system, because they spend 50% of their practice time staring down a Cover 3, a Cover 2, seeing where the weaknesses are in zones, seeing how to attack different alignments and coverages, etc. In addition, teams often put their best athletes at quarterback. It doesn't hurt that he has a 3.97 GPA. As far as his defensive position goes, I fully expect Morgan to play middle linebacker at the next level. He has the prototypical body type for the position. He flows well to the ball and keeps his shoulders square to the line of scrimmage. And when he hits, he puts some force behind it. You can tell by the way he runs the ball and the way he tackles that he understands leverage and getting underneath his opponent. He also times his blitzes well and stays under control when attacking. I understand why he's a 3-star kid. He's not a quick-twitch athlete. He looks like the type of player who will fill out to be about 245 lbs., plug his gap, make a bunch of tackles, contribute as a blocker or wedge buster on special teams, and just be a solid overall player. I would expect that he will redshirt in 2011 and spend another year or so on the bench before really pushing for playing time (Kenny Demens runs out of eligibility after 2012). I'm not expecting Morgan to win the Butkus Award, but I'm looking forward to him putting on a winged helmet. Between Morgan and fellow Class of 2011 defender Kellen Jones, the Wolverines are putting together a solid crew of linebackers. 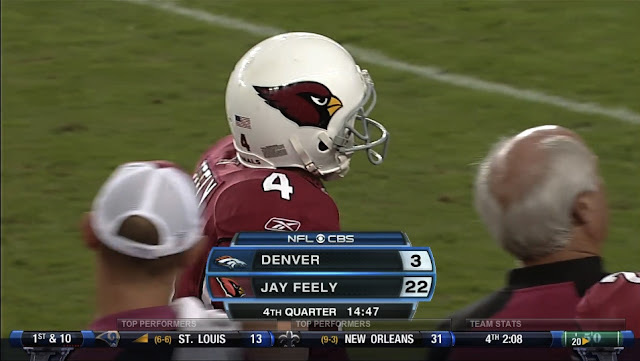 Arizona Cardinals kicker Jay Feely had a fantastic day for a kicker on Sunday. As you can see above, Feely was a juggernaut. He was 5-for-6 on field goals, including a 55-yarder. He also scored a touchdown on a 5-yard run and made all 4 of his extra points. 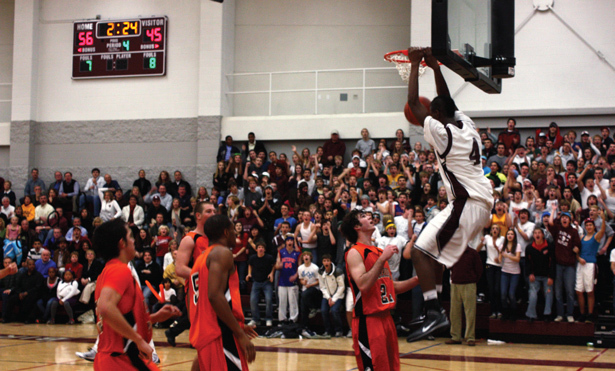 In the 43-13 victory over the Broncos, Feely had 25 points. But there were a lot of guys deserving of honorable mention . . .
a. Tom Brady, of the New England Patriots, helped beat the Chicago Bears, 36-7. Brady was 27/40 for 369 yards and 2 touchdowns in the snow. b. Dhani Jones, a Cincinnati Bengals linebacker, had 8 tackles, 1 sack, 1 tackle for loss, and 1 quarterback hurry in a 23-7 loss to the Pittsburgh Steelers. c. LaMarr Woodley, who helped his Steelers beat Jones's Bengals, had 5 tackles, 2 sacks, 2 tackles for loss, 2 quarterback hurries, 1 interception, and 1 pass breakup. The following list is a wish list of tight end prospects in the Class of 2011. This list takes into account Michigan's needs, its offensive system, and the depth chart. For example, Jerell Adams is a very good overall athlete, but Michigan's lack of depth at tight end means that any tight end in this class has to be ready to contribute by 2012 at the latest. Big (6'5", 255 lbs. ), fast, and physical. Reminds me of Alge Crumpler. Catches the ball well in traffic. Doesn't have great speed, but very shifty after the catch. Good frame for adding weight to 6'4", 215 lbs. Excellent feet and a very tough runner after the catch. Very good size and body control. Small-ish tight end, but a very willing and fundamentally sound blocker. Very good speed but needs to add weight. Large tight end (6'4", 247 lbs.) who's a powerful runner. Not an extremely adept blocker despite size. Solid but unspectacular all-around athlete. Could also play outside linebacker. Good size and frame. Average speed. Seems a bit undisciplined and doesn't finish routes. Large wide receiver/small tight end prospect. Needs to add weight to 210 lb. frame. Could also play outside linebacker. Tall, rangy athlete with decent speed. Serious developmental prospect who played quarterback and safety in high school. Generally looks like one of those kids who's tall, long, and somewhat fast . . . but isn't really a great football player. 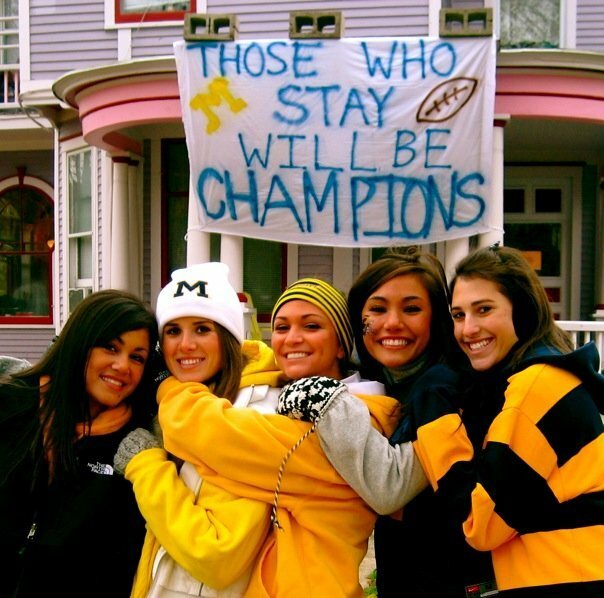 If you happen to have any other pictures of girls wearing Michigan gear, feel free to e-mail me at touchthebanner@gmail.com. Several coaches from schools around the country have been fired, retired, or resigned recently, and some of those coaching situations may have an impact on Michigan. Here I'll discuss the ways in which the departures of Urban Meyer (Florida), Randy Shannon (Miami), and Dave Wannstedt (Pitt) might impact the situation in Ann Arbor. I don't think any of them necessarily signify impending doom for Rich Rodriguez (Urban Meyer isn't coming to Ann Arbor), but they might affect the Michigan program in smaller ways. All three schools I'm going to focus on harbor Class of 2011 commits who have Michigan offers. The three players in the above lists who have shown the most interest in Michigan are Showers, Jarrett, and Kline. Showers is from Michigan, and the other two seemed to be giving the Wolverines a fair look before committing to become Panthers. Assuming that Florida's head job is filled by someone with Florida roots (Mississippi State's Dan Mullen, Louisville's Charlie Strong), I doubt that many Gator commits will waver. However, Pittsburgh's open job will likely be filled by an outsider, and that means Jarrett and Kline might be ripe for the picking. Jarrett has reportedly sent out feelers to other programs, including Michigan, and Kline had Michigan in his top few schools at one point. Urban Meyer's intentions are to coach the Florida Gators in the Outback Bowl on New Year's Day. 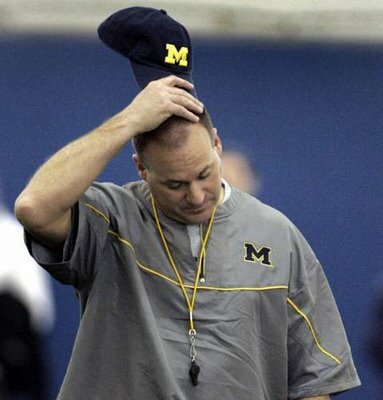 However, just like Michigan did with Rich Rodriguez back in 2007-2008, Meyer's replacement might be hired prior to January 1. That guy might be Mississippi State's Dan Mullen. And even though Mullen is familiar with the landscape of Florida and has only been gone from Gainesville for a season, I'm not sure that Florida's athletic director would want to sacrifice several weeks of recruiting right near the end of the cycle. I would not be surprised to see Meyer's replacement hired within the coming week; if Mullen's the guy, he probably won't be coaching the Bulldogs on January 1. 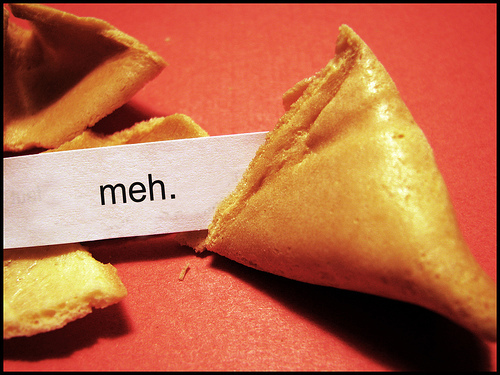 Of course, that doesn't mean that Mississippi State would be a mess for the bowl game. Going back to that Michigan/West Virginia situation in 2007-2008, interim head coach Bill Stewart led the Mountainers to a 48-28 victory over #3 Oklahoma. It's practically a foregone conclusion that, at the very least, defensive coordinator Greg Robinson will be gone before the 2011 season. If it doesn't happen prior to the bowl game, it will happen soon after. But with the tenuous status of the entire coaching staff at Michigan, it's not like some coordinator out there is going to accept a job at Michigan this very instant. For now, Robinson is the guy. None of Pitt's staff is likely to come to Michigan, but the Miami and Florida staff changes may have an effect. Randy Shannon was a very good defensive coordinator for the Hurricanes for six seasons before becoming head coach. He also has NFL experience with the Miami Dolphins, so heading back to the NFL isn't out of the question. Shannon seems like a long shot to come to Michigan as a coordinator, especially because Michigan has a tradition of underpaying coordinators. Athletic director David Brandon might signal a new regime by shelling out some dough for a big-name coordinator, but I have my doubts. Vance Bedford. Bedford was a defensive backs coach at Michigan for five total seasons, most recently in 2007. He then joined the Florida staff and followed Charlie Strong to Louisville to become defensive coordinator, where he currently has the #12 total defense and the #15 scoring defense in the country. If Strong becomes head coach at Florida, that might cause a shakeup in his staff, but I don't see a significant reason that Bedford wouldn't follow Strong back to Gainesville except for . . .
Chuck Heater. Heater was a running back at Michigan from 1972-1974. Though he hasn't coached at Michigan, he's still a "Michigan Man." He succeeded Strong as defensive coordinator at Florida, and has the #9 total defense and #31 scoring defense in 2010. If Strong were hired, Bedford or Heater would likely head elsewhere for a coordinator position. Since Bedford seems to be Strong's "guy," this might make Heater a free agent. The availability of these guys is largely based on speculation and connections to Michigan, so I don't have any inside sources saying that David Brandon is pursuing these guys. However, they seem like fairly logical choices to replace Greg Robinson at Michigan. As I said in a prior post about Rodriguez's future in Ann Arbor, I stated that one of the caveats should be that a defensive coordinator should be hired and Rodriguez should be told to keep his hands off the defensive side of the ball. Shannon, Bedford, and Heater have the experience and credibility to come in and run their systems without too much blowback. All of these dominos are unlikely to fall, but they're things to consider as Michigan likely searches for a defensive coordinator and staff this offseason. I know it seems like I choose Tom Brady a lot . . . but what can I say? He's awesome. Brady completed 21/29 passes on Monday night against the Jets for a total of 326 yards, 4 touchdowns, and 0 interceptions. And his Patriots team beat the New York Jets, 45-3. Honorable mention: Pittsburgh Steelers outside linebacker LaMarr Woodley had 2 tackles, 1 tackle for loss, 1 quarterback hurry, and 1 big fumble recovery in a 13-10 divisional victory over the Baltimore Ravens. If you're a subscriber to Sports Illustrated, then you may have already read this article. But if not, here's a link to "The Courage of Jill Costello" by Chris Ballard. There's not much that I can add to it beyond what Ballard already did, but you'll be a better person for reading it. Michigan fans won't be seeing these hops on the football field anytime soon. I received a message from a reputable source a couple weeks ago that this would happen, but it was being kept on the down-low. Now it has become public. 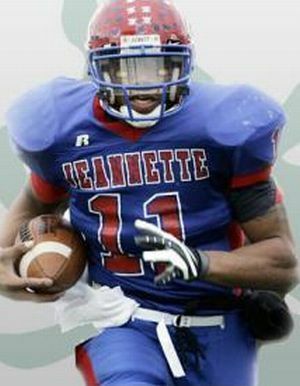 Class of 2011 wide receiver recruit Shawn Conway will not qualify by NCAA Clearinghouse standards. He still plans to play football at Michigan in the future, but he'll have to attend junior college before doing so. I am not counting on Conway playing at Michigan anytime in the future. I am certainly a fan of his abilities, but junior college players rarely are recruited or accepted to Michigan. Conway would have to earn his associate's degree at said junior college before even having a shot to transfer to the Ann Arbor campus. Michigan is historically a difficult school into which to transfer, which is why not many JUCO recruits are pursued by the coaching staffs. The last JUCO transfer to get into Michigan was linebacker Austin Panter in 2007, but he was the first since the early '90s. It is possible, however, that since Conway knows he wants to attend Michigan, he can find a JUCO academic program whose credits will transfer to U of M. I'm not holding my breath, though. This leaves Michigan with zero outside wide receivers in the 2011 recruiting class. It has been apparent that the coaches wanted at least two receivers in the class, and the news about Conway was probably the reason that Michigan offered California wide receiver Devin Lucien in recent weeks. It might also be why Justice Hayes was welcomed into the fold with such open arms when he decommitted from Notre Dame a couple weeks ago; Hayes is more of a slot receiver, but has the size and ability to play outside, too. Conway is the second subtraction from the 2011 class within a week. Over this past weekend, quarterback Kevin Sousa changed his verbal pledge from Michigan to Wake Forest. This also continues a disturbing trend of Rich Rodriguez recruiting academic question marks. 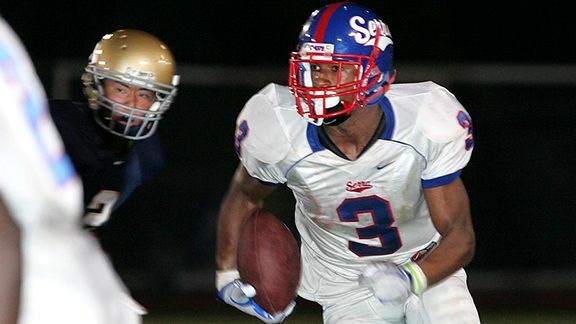 Class of 2009 cornerback Adrian Witty failed to qualify, and four players disappeared from the Class of 2010 due to grade issues (Demar Dorsey, Antonio Kinard, Conelius Jones, and Davion Rogers). I expect that Michigan will continue to recruit Lucien and North Carolinian Kris Frost, who doubles as a linebacker prospect. Florida slot receiver Prince Holloway is also a potential option. Gator Bowl, here we come! It was announced on Sunday that Michigan will be playing the Mississippi State Bulldogs in the Gator Bowl. Not only did Michigan bounce back to bowl eligibility in 2010, but they're playing in a New Year's Day game, perhaps the best day of college football. The game will be in Jacksonville, Florida, on January 1, 2011, at 1:30 p.m. on ESPN2. Mississippi State ended the season ranked #21 with an 8-4 record. Their signature win was a 10-7 victory over Florida, but the Bulldogs also lost close games to Arkansas and Auburn, two good teams. More statistics and analysis will be provided as the month goes on, but with guys recovering from injury and various other dramatic events that might unfold in the next few weeks, an in-depth preview at this point might be premature and outdated by the New Year. Quarterback Kevin Sousa, who had been committed to Michigan since June 2010, has decommitted in favor of the Wake Forest Demon Deacons. 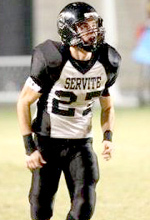 Sousa is 6'2", 213 lbs., and the #22 dual-threat quarterback to Rivals. Here's the commitment post I wrote for him a few months ago. Sousa started to hint that he might be re-opening his recruitment last month when he showed a bit of disappointment that the Michigan coaches were continuing to recruit other quarterbacks, namely Marquise Williams (who was committed to North Carolina and now is a Virginia Tech commit). While Sousa didn't seem to mind the highly touted quarterbacks already on Michigan's roster, he was clearly agitated that Michigan didn't seem to be fully devoted to him as their future quarterback. So while Michigan's coaches didn't seem convinced that Sousa was their guy, they also seem to have struck out on all or most of the quarterbacks ahead of him on their wish list (and mine). The two remaining uncommitted quarterback prospects on Michigan's board are Cardale Jones (Cleveland, OH) and Tanner McEvoy (Oradell, NJ). Jones hails from Glennville High School, a program helmed by Ohio State-loving Ted Ginn, Sr. He's a bit of a poor fit for Michigan's system, and I can't see him succeeding in an offense predicated on the zone read option. Meanwhile, McEvoy spent his high school career as a receiver before switching to quarterback prior to his senior season. He did enjoy some success this past fall (26 passing touchdowns, 11 rushing touchdowns at last count), but one can only assume that he would be a bit of a project as a quarterback. 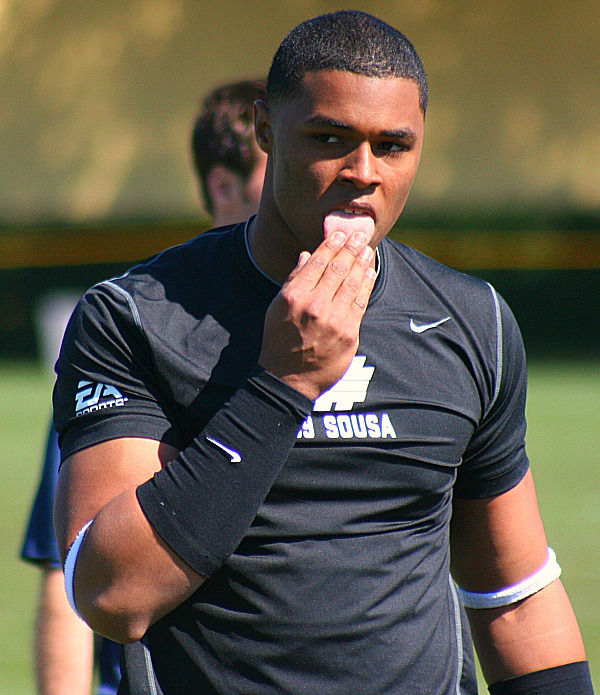 In my opinion, Michigan needs to bring in a quarterback prospect in the 2011 class. Some fans think the Wolverines can get away with avoiding the quarterback position for 2011 and going after some players in 2012. I think that would be a mistake. It's entirely possible that the coaching situation at Michigan could cause one or more transfers. If Rich Rodriguez remains at Michigan, the chance exists that Tate Forcier might want to go elsewhere; he's good enough to start at many places in the country. 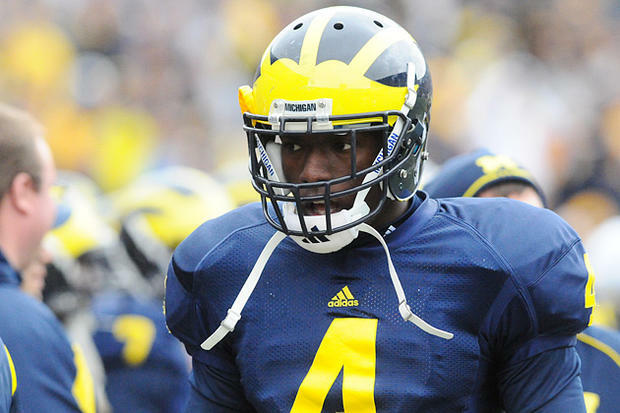 If Jim Harbaugh is hired, I'm not sure how Denard Robinson fits. Meanwhile, it's unclear how Tate Forcier would feel about playing for Harbaugh. Forcier would seem a better fit for Harbaugh's system, but Tate's older brother Jason (also a Michigan Wolverine back in 2005-2006) threw a total of 13 passes under Harbaugh after transferring to Stanford. Even if each of the quarterbacks remains, that gives Michigan only three on the roster (the aforementioned Forcier and Robinson, plus freshman Devin Gardner). One or more transfers would obviously leave Michigan perilously thin at the position. The decommitment of Sousa leaves Michigan with 13 commitments in the Class of 2011, and Michigan should have 22 to give. Approximately nine slots remain open. Marquise Williams (QB) changed his commitment from North Carolina to Virginia Tech. Melvin Gordon (SB) changed his commitment from Iowa to Wisconsin. Sammy Watkins (WR) committed to Clemson. Austin Traylor (OLB) committed to Wisconsin. Dallas Crawford (CB) committed to Michigan. This is the order in which I would rank the receivers Michigan has offered. Star rankings don't matter, the likelihood of a commit doesn't matter, etc. ; these rankings are purely based on my ideal team. Has great speed and acceleration for a good-sized kid (6'2", 192 lbs. ), high points the ball, and can run after the catch. Only average speed, but runs excellent routes. Catches the ball well with his hands, has good size, and high points the ball. Good speed and excellent after the catch. A bit of a showboater. If you want an example of highlights that are clearly doctored and sped up to make a kid look faster, check out this kid's video. Still, he's fast and elusive. Could play inside or outside. Good athleticism. Not afraid to go over the middle. Doesn't adjust well to the ball in the air, doesn't high point the ball, catches with his body. Great speed. Runs tentatively and isn't extremely shifty. Small-ish slot receiver. Not a need in this class. Reminds me Roy Roundtree with body control and elusiveness, albeit smaller. Small-ish slot receive type, a position that Michigan doesn't need to recruit at this point. Tiny, extremely shifty and elusive. At 5'6" and with limited position versatility, not a need at this point. Chesapeake Bowl: December 30, 2010. Anyone interested? On December 30, 2010, the Chesapeake Bowl will be taking place in Towson, Maryland. There are several recruits involved who might be of interest to Michigan fans, although not many are potential commits at this point. The North roster includes WR Damiere Byrd, S Dondi Kirby, S Sheldon Royster, DE Desimon Green, WR Bill Belton, LB Armstead Williams, LB Ben Kline, CB Kyshoen Jarrett, DE Deion Barnes, OT Paul Gaughan, OG Rob Trudo, and TE Jack Tabb. The South roster includes WR Darius Jennings, DT Vincent Croce, RB Malcolm Crockett, DT Kevin McReynolds, DT Darian Cooper, and OT Cyrus Kouandjio. I am considering making the trek to Towson for the game. It's not a certainty because I might be out of town and visiting family, but if anyone else in the area is interested in meeting at the game, feel free to comment here and/or e-mail me at touchthebanner@blogspot.com. Poll Results: What to do with Cam Gordon? Several weeks ago, I asked the question, "What should be done with [then free safety] Cameron Gordon in 2011?" I would like to know what the idea behind "Other" is. If anyone remembers voting or has any ideas that I didn't list, please feel free to leave a comment. I'm curious. I can only think of maybe moving him to tight end or defensive end as further options, but maybe there are other lines of thought. Anyway, assuming the 3-3-5 defense continues to be run at Michigan, I think Spur is a good spot for Gordon. For those keeping track, Gordon was moved to Spur for the Penn State game several weeks ago. That isn't to say that Gordon will remain there next season (he played WR as a freshman, FS for half a year, and is now at Spur, so position changes are frequent), but that seems to be the train of thought right now. New England Patriot Tom Brady completed 21 out of 27 passes for 341 yards and 4 touchdowns in a 45-24 victory over the Detroit Lions on Thanksgiving Day. Honorable mention: Zoltan Mesko, the punter for the Patriots, averaged 51 yards on three punts in that same game. Also, New York Jets inside linebacker David Harris had 5 tackles, 1 sack, 1 tackle for loss, and 1 quarterback hurry in a 26-10 win over the Cincinnati Bengals on Thanksgiving.